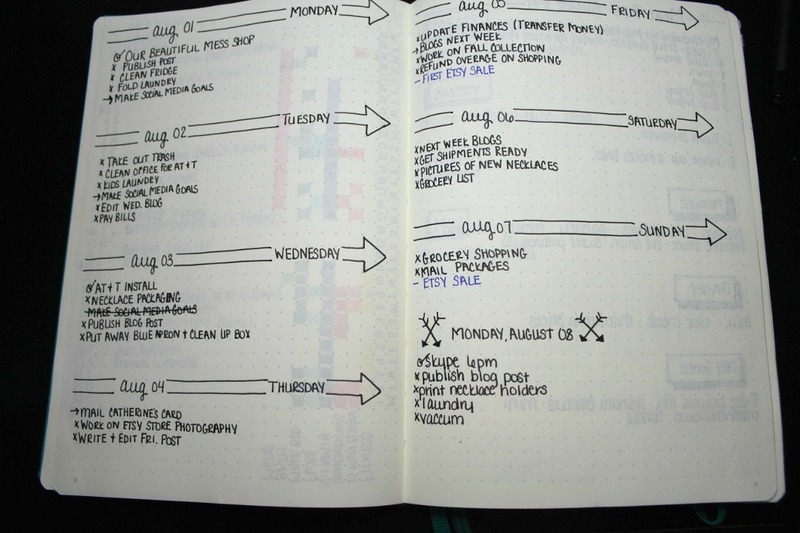 So for awhile now I have teased that I bullet journal in a few posts off and on. Plus I have posted some pictures on Instagram as well of my bullet journal. But let me start by saying that I am no expert. I saw this thing called a bullet journal on Buzzfeed and was interested in the idea since I felt scattered and not focused with anything. Basically I had a lot of stuff in my head and nowhere to put it. 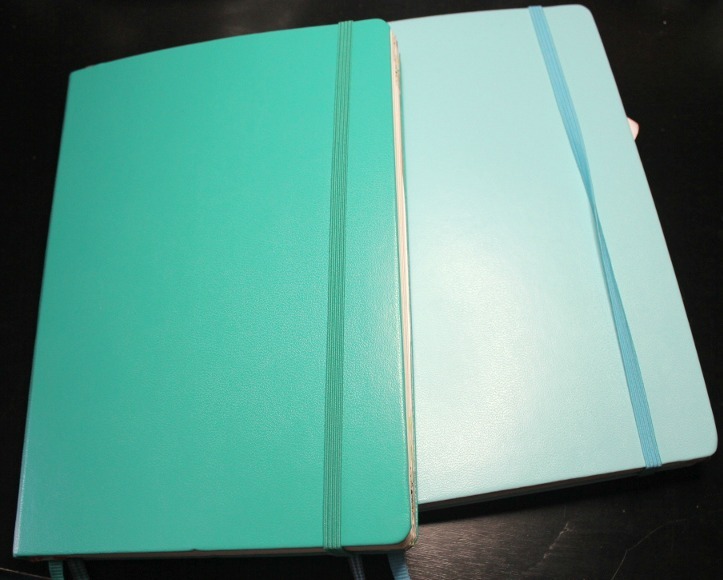 So I liked the idea of having a notebook which would be a one stop shop for everything floating around in my brain. Since I don't go into anything without a plan I started watching YouTube videos and reading blog posts and looking at Instagram pictures to get an idea of the best way to use my journal and quickly discovered that the beauty of the bullet journal is that you use it however you want to. You decorate or you don't. You track everything or you don't. It's super functional or it's less so. It can be anything you want. So I definitely loved that idea. So I got started. I got myself a popular journal used for bullet journaling a Leuchtturm 1917 dot grid. I wasn't sure exactly how I was going to do this but I was all for it and I was excited. 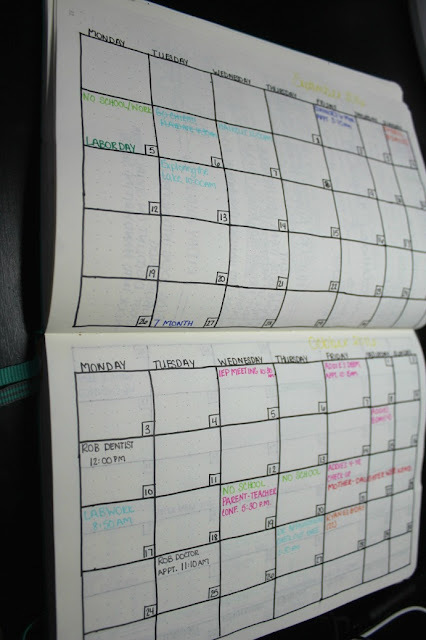 I have been looking for a hobby and a way to help me stay more organized. I started back in August 2016, hated my handwriting but loved how it was going. It was a learning experience to figure out what I liked and what I didn't but I loved having everything in my brain written down, plus I felt more productive each day. I started pretty basic with my layouts. I definitely didn't do anything fancy. I was definitely thinking just functional when I started. However I did get discouraged pretty quickly when I realized how horrible my handwriting was and how it was nowhere close to what I had envisioned. But I decided that would come in time and with practice but the best thing was to focus on why I loved this journal and not let me give up on it because of something as silly as my handwriting. I also learned quickly that my drawing skills were definitely lacking. But I started playing around with more spreads such as tracking the books I read. A lot of my first bullet journal was just getting my feet under me and figuring out what I liked and what I didn't. The biggest proof of that was my future log. You can see the future log is may different ways and I tried it a different way before I discovered I liked calendar form. I liked to see the month laid out for me to see each week and write in what we had going on. 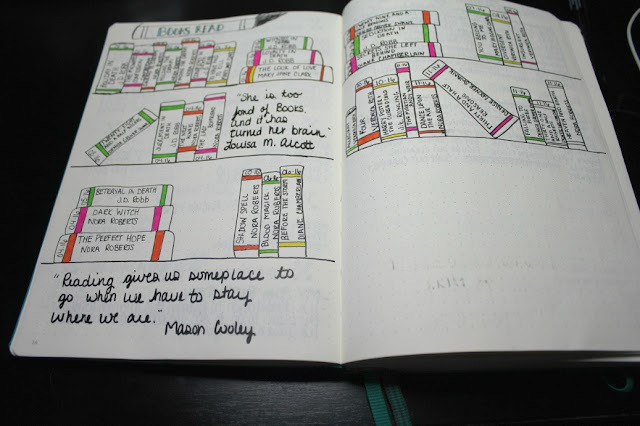 It was just easiest for my brain - again another great part of the bullet journal, you do it however works best for you. By my second month into using my bullet journal I was really getting my feet under me. I started using more color and even some washi tape. My handlettering was (and still is even) lacking but I was caring less because it was working. I was struggling to find the best use of my habit tracker and still am even but I'm working on figuring out the best way to make it work for me. Or even get rid of it all together. I haven't decided yet. 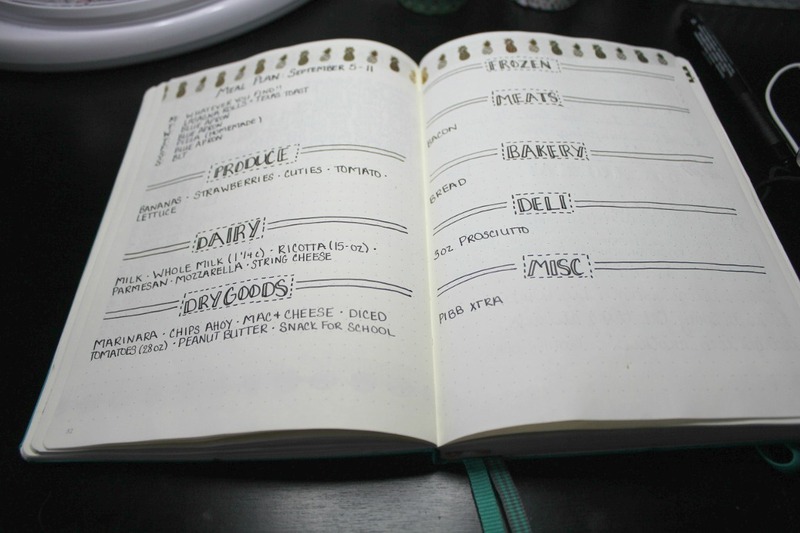 But I was getting the best out of my bullet journal and started adding in meal planning to it. I feel like I am always meal planning and I loved having everything in one spot. I could check out schedule to see if I needed to plan a special meal and also have the meals and grocery list all in one place. My bullet journal really was becoming my brain. Like I said in September I was definitely adding more to each page. I wanted more color. I also started adding in the weather. I started putting quotes at the end of each day. I just wanted extras to each day to make it more fun. I still loved the functional part of it but loved having fun putting in color and all the extras. I was even adding in the occasional favorite picture and coloring pages that I printed out and used to keep myself busy when I was looking for something mindless to do. 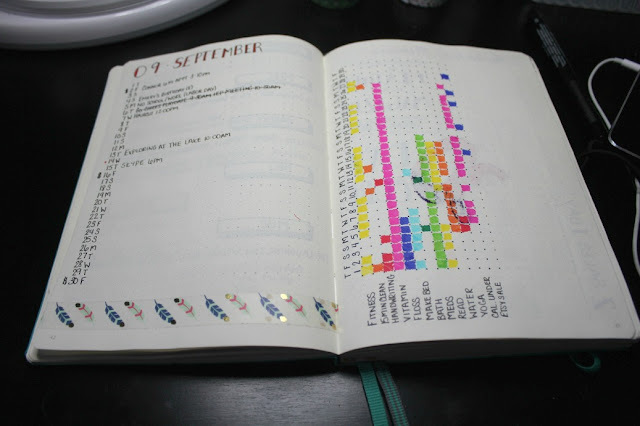 By October I decided to start color-coding. I got washi tape for Halloween which I used to decorate pages. 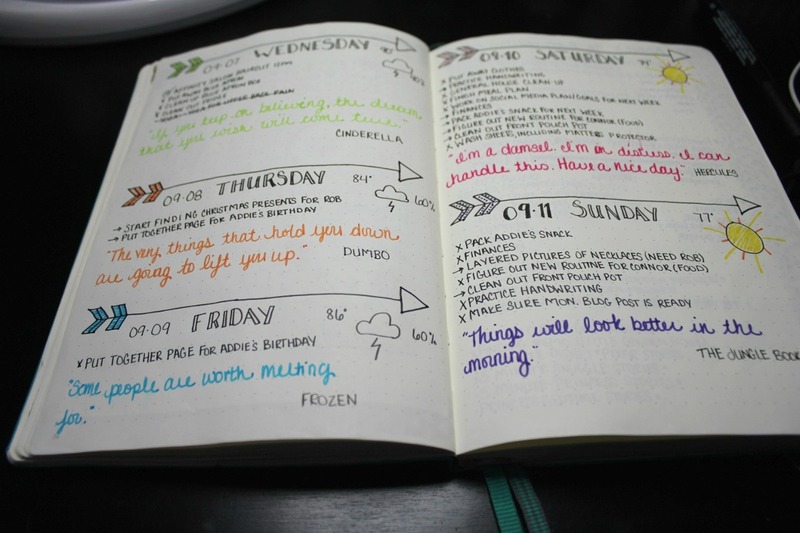 I decided to lose the weather and I add a new page for quotes instead of putting them at the end of each day. 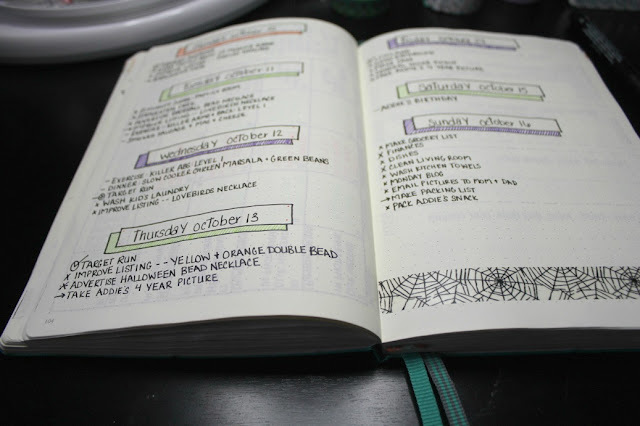 Although I didn't include any November pages in, I continued color-coding and fall washi tape. Plus I added in things I was grateful for at the end of each day. When December came around I wanted to do more with my headers. So I tried my hand at drawing ornaments which sometimes went better than other times. 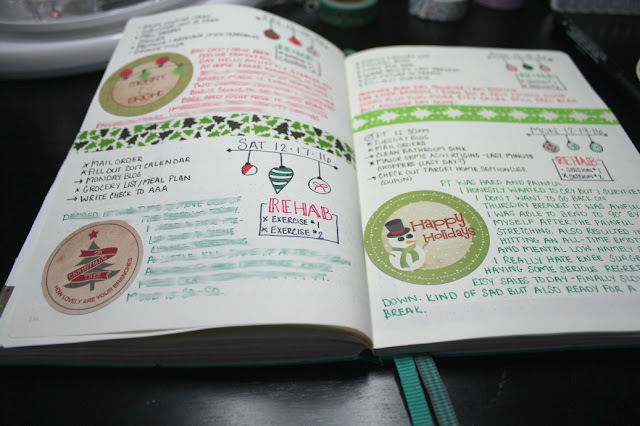 I continued with Christmas washi tape and color-coding and actually started journaling at the end of each daily as a way to track my knee surgery recovery in a few sentences each day. I didn't always achieve a lot since I was laid up but I continued to use my bullet journal every day (I smudge some because some stuff just isn't meant to be shared...you get it). Sometimes in December I got some cute tags and that kind of thing that I started adding it. I loved including more color and more decorations. 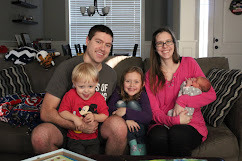 It really was becoming more than just functional for me. It was becoming something I loved doing each day. 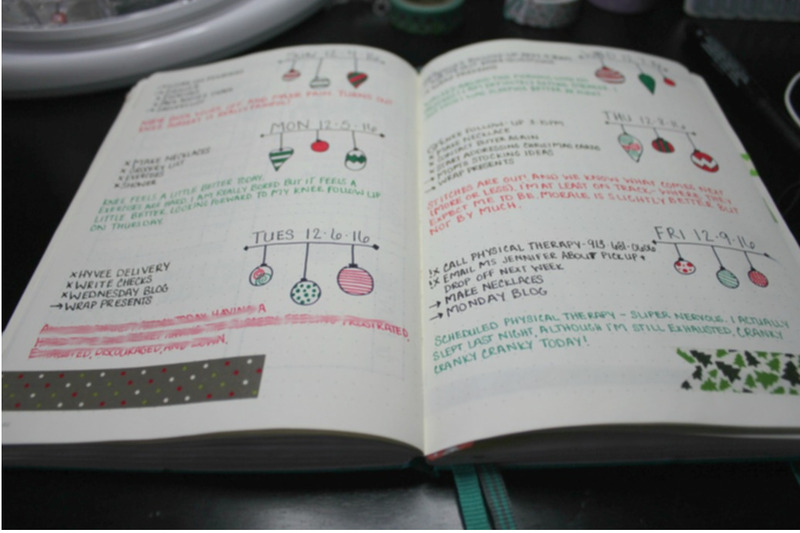 I had about a third of my journal left at the end of December which meant I faced a point where I struggled with what to do. I thought about continuing in this journal into the new year but I knew I wouldn't make it very far with it and I would have to redo all the calendar pages and such. Or I could start a new notebook and have a fresh start for a new year. And that's what I ultimately ended up doing. I wanted a fresh start. 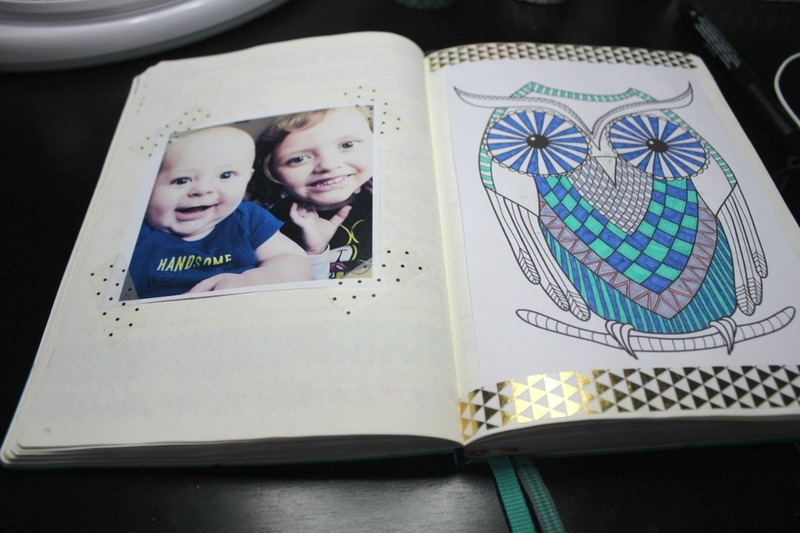 Come back tomorrow to see more pages from my current journal.